I hope to add a brief history of Tribal bellydance to this section of the page. For now, a portion of the history is covered in my article, "Tribal Definitions", which you will find below. I welcome any feedback on this or any other portion of this site. Please feel free to write me anytime. by Shay Moore of Deep Roots Dance Originally written in 2004. Updated in 2007. For many years, in my personal definition, tribal bellydance's main focus is on a group improvisational style, or is based at least strongly in the aesthetic and concepts. However, in recent years, the term has been appropriated for a wide swath of dance styles, including some that hardly resemble bellydance. As such, I have had to adapt this article to better explain the terms as they are commonly used, to help alleviate the confusion that is abounding surrounding the term "tribal". It would be impossible to try and outline all the various styles that have come to be gathered under the big old tribal umbrella. Herein I will try to enumerate some of the largest or best known styles of tribal as I understand them. Bottom line: tribal isn't "just tribal" any more. These days it seems everyone has a different take on the various terms floating around. With new terms and interpretations popping up all the time, it's hard to know what someone means by what they say any more when talking about "tribal bellydance". I use the term "tribal bellydance" to generally refer to most styles of this dance, excluding the direct stylistic ancestors of FatChanceBellyDance, which I refer to as ATS (see further definition below); but really there are many different sub-genres which are more concise when discussing specific interpretations of the aesthetics and philosophies encompassed within the greater category of tribal bellydance. Much like saying "bellydance" is usually enough information when discussing this art casually; from a scholarly standpoint, we all know there is Arabic, Egyptian, Turkish, Lebanese, and so on which can be defined if one wishes to go into greater detail. I wrote this article to outline MY PERSONAL take on the current trends in tribal terminology. I invite you to take what you will from it. I always welcome comments and questions, so please feel free to write with your thoughts. Tribal and ATS dance forms are rooted in a movement in the US in the 70's, mainly driven by "folkloric" groups performing at Renaissance Faires in California. Drawing it's movements, costuming, and general inspiration from the tribal cultures of the Near East, Middle East, Northern Africa/Maghreb, and Spain, the then-named "California Tribal" bellydance was, and it's current incarnations continue to be, a conglomeration of many different influences, not the least of which being what we recognize as traditional bellydance (Raqs Sharki/Danse Orientale...). 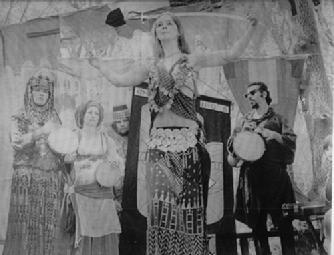 The precursor to tribal improvisational bellydance, the Rennaisance Faire groups such as the famous "Bal Anat" (above-left) and lesser known but still pivotal "Bou-Saada", largely performed cabaret stylings, but in "fake-loric" costuming. It is commonly known that, as unromantic as it sounds to tribal bellydance historians, these dancers who hit the Ren Faires by day simply changed costumes and danced the night away at the restaurants. They were cabaret dancers in Ren Faire drag, if you will. There were some obvious differences which reveal this style to be stylistic acestors of some styles of tribal we know today, the most obvious of which being the costuming. The idea of using earthy, ethnic textiles, coins, many layers, very full pantaloons, and headwraps/turbans began with this style. Non-synthesized music was also a staple, being that many performances were done outdoors in a themed venue. And the idea of chorus, previously a balletic concept to most, was introduced to the bellydance world. Individual dancers or small groups of dancers would be featured in front, while the other dancers would perform or clap or generally play "moving backdrop" to the featured performers. And lastly, one will find that the terminology of ATS closely resembles that of the Jamilla Salimpour format, though not in its entirety, and the execution of the moves has evolved separately over the years. FatChance and Carolena Nericcio (right) were the ones who first coined the term ATS (American Tribal Style)--an alteration of the term "California Tribal" (attributed to Morocco of NY) which is part of the roots of the tribal family tree (see above in "Classic Tribal"). It is the original format of group improvisational bellydance and the precursor to other forms of Tribal as we know it today. Over the years, ATS developed many iterations that spread to other cities as it was interpreted by many different dancers and teachers with varying levels of exposure to the original source, via videos and workshops. In recent years, Carolena has seen what has become of the style she birthed, and is doing her best to codify the style, and reappropriate the term to apply to only her format and approved vocabulary. One who wishes to pursue this style in earnest, and use the term ATS for their style of dance, have resources available to them in the form of certification programs developed by Carolena, as well as teacher certifications and sister schools that are beginning to sprout around the world. This is a term I have adopted to refer to group improvisational styles of tribal bellydance that are *not* strictly American Tribal Style--as of 2006, Carolena Nericcio has become quite vocal about her feelings that ATS should refer strictly to her style of dance, format, and approved vocabulary, and I respect that. There are other acronyms and terms floating about right now (Improv Tribal Style, Tribal Improv, etc), and until one sticks, there is no official term for this subset of tribal. However, I felt itimportant that the name stamped on this style contain the word "group". There are a lot of tribal derivatives, which are also improvisational, but do not rely on the connection of a group of dancers working on-the-fly from a common vocabulary. As such, the term I have adopted puts it right in the name: tribal *group improv*, and makes it clear that it is a dance performed primarily as a collective. Until such time as some other term forces its way to the fore of our community vocabulary, this is the term I shall use for this style. In TGI bellydance, participants learn a common vocabulary of movement, and through subtle cueing and a lot of practice to develop non-verbal communication, dancers can create a largely extemporaneous performance that appears choreographed to the audience. Vocabularies vary from tribe to tribe, much like a regional language or slang, and may include individual moves or short combos. And yet, while this dance has wide appeal to audiences and many dancers turn their intentions toward the entertainment value of tribal bellydance, the dance itself is does not necessitate performance on stage for an audience. This dance draws also on some of the cultural conventions of the tribal peoples it emulates, and many women find great camaraderie, comfort, trust, and friendship through the dance experience, and devote their time to the social and emotional aspects of the dance. The opportunity to communicate through the body, through the music, and through the group dynamic appeals to many dancer's sense of community, which is encouraged and fostered in classes and "open dance" venues. Costuming is often colorful, with large full skirts and/or pantaloons, Indian-style cholis, decorated bras (coins, textiles), hip scarves, tassel belts and/or long fringe, and some sort of detailed head wrap, decorations, flowers, or turban. Popular, too, are Melodia-styled and other funky flared pants with layered hip wraps and dangling acoutrements. Any or all of these elements can be mixed and matched with other "ethnic" pieces, but in general, this is the uniform of tribal bellydance. The overall aesthetic can vary from eclectic folkloric-styled costuming to industrial new-tribal/urban primitive. Individual interpretations are always encouraged, but some basic guidelines to stay within tribal styling include: natural fabrics such as cottons and silks, velvets, rich jewel tones or earthy coloring, shisha and other ethnic embroidery, mirror-work, tassels, copious layering, mixing and matching (not coordinating too closely), coins and bells, chunky necklaces, bracelets and other jewelry, "tribal" make-up and facial markings, and more. Things to avoid: chiffon and other filmy fabrics, heavy/dense sequin and bead work, pastels, bra-as-sole-dance-top, flashy appliqué, bare legs/skirts with no leggings underneath, tight fitting skirts/dresses, delicate jewelry, heavy use of satin or "high shine" fabrics, pailettes, lamé, etc. There are many interpretations of the concept of Tribal Fusion, so herein I will include mine. Tribal fusion, to me, refers to the marriage of choreographed and improvisational forms, specifically with significant emphasis given to what would be considered "American Nightclub" or "Cabaret" styles of belly dance; but can also refer to emphases on specific ethnic dance influences, such as "Indian Fusion", "Flamenco Fusion", "African Fusion", and the like. Tribal Fusion is the combination of tribal belly dancing and costuming with influences of other belly dance and related dance styles which do not necessarily appear in the common tribal belly dance movement vocabulary. For instance, within a tribal belly dance performance, the incorporation of more flirtatious, less "grounded and earthy" moves might create a fusion. The incorporation of predominantly Indian stylings, such as mudras and footwork might create a fusion (such as inFusion Tribal's Bhangra Fusion). The use of djembes in musical selections, and the addition of African shimmies and stomping could be called a fusion (such as Domba). The combination of hip hop-inspired pops and locks with modern/interpretive contorsions and jazz floor patterns and Western music would create a fusion (such as Urban Tribal Dance Company). So long as the many or most of the basic elements which define tribal (see above) *and* bellydance are still predominant in the performance, it could be referred to as a tribal fusion. Once the common definitions of tribal or bellydance are discarded, it would no longer, in my opinion, be appropriate to use the term "tribal fusion", and crosses into either folkloric dances, Tribaret, Alternative bellydance, general bellydance fusion, or interpretive dance. Where's the Tribal in That Tribal Fusion? There is a rash of both solo and group dancers who started out as Tribal or Tribal Fusion dancers who have continued to cling to this moniker despite radical stylistic changes--as well as dancers who have not yet dabbled in Tribal who desire the freedom and community which Tribal seems to offer and choose to use this term to align themselves with this stylistic movement--which make the use of the term confusing and nonsensical. While innovation and change are the mark of a strong and thriving art form, clarity in our communications are equally important; and thus finding a name which best describes what we are hoping to convey to our audiences is a vital goal. Many of these new fusions I define as “Alternative Bellydance”, or if you must, “Alternative Tribal” (see below). Of course, simply “Fusion Bellydance” is a solid place to start should one be uncertain where they fit into the “grand scheme”. This broad term leaves the most room for interpretation and exploration without tethering oneself to a specific stylistic category, and avoids adding to the terminology confusion which already exists. A hot topic of discussion and debate is where soloists fit into the Tribal scheme, given that it is primarily a group dance form at its roots. Tribal Fusion has become the catch-all term which has become the moniker for a soloist dancer in tribal costuming and/or tribal movement stylizations. In my opinion, to truly use the term "tribal", the performance should utilize movement and stylings common to the group improvisational format from which this style draws its name. One could say a soloist inspired by or heavily influenced by ATS/Tribal is a Tribal Fusion Dancer. Naturally, the performance itself would not translate well if it adhered to all the same rules and aesthetics which are a product of the format limitations on group improvisational dancing, but the overall performance should resemble Tribal bellydance in most of the recognizable aspects—posture, costuming, and overall presentation. But the term itself is used much more broadly than my personal interpretation. Tribaret is a word I coined out of necessity to be clear about the fad of tribal, wherein groups seem to be rushing to embrace the word "tribal", whether they are studying/incorporating all the details that go along with that moniker or not. Others may be using this same term to define another phenomenon or style, but herein is how I coined this word to mean. I use the term tribaret mainly to refer to the fusion of tribal bellydance--usually in costume only--with the cabaret style of bellydance, and the dancers calling themselves tribal despite the fact that they do not fit some of the basic criteria which defines tribal bellydance. Tribaret can refer to performances done in tribal costume in which improvisation is very minimally used and the remainder of the performance is distinctly cabaret in style, performances where tribal costuming is used but no tribal moves or concepts are used at all, a performance in which improv is used significantly yet the costumes are distinctly cabaret inspired, and so on. Ultimately, it is a fusion of tribal and cabaret in which the key elements of tribal are nearly or completely ignored. For instance, a group that does a lot of tribal improv, but wears only panel skirts over bare legs, bras, and epaulettes would be tribaret. A troupe that does a cabaret style choreographed dances while wearing heavy skirts, mirror cholis, and tassel belts is tribaret. There are many nuances which are involved in what is tribal style versus cabaret, but usually a distinction can be made when, as mentioned before, key elements which define tribal are left out and largely only the claim of being tribal truly remains. Some dancers have found this term resonates with them, and are using the term, along with the related term “Glamour Tribal”, to describe their style of costuming and dance. But much like the other categories already discussed, this definition is one of much debate and is still in flux. Remember folks, if definitions were all in the costume, then a TV repairman could call himself a heart surgeon if he put on scrubs. The costume just does not define the dancer as Tribal. Concentrated study of the art does. As history shows, tribal bellydance has its roots on the West Coast, and the growth and innovations driving the "movement" of this art form still largely originate there. As a result, in the past there were few to no instructors on the East Coast of the US to teach this dance to interested dancers there. Video only goes so far, and where media instruction left off, many dancers back East began to develop their own interpretations of tribal based on their experiences in their communities. Being that most of them had little or no exposure to the improvisational formats, but instead possed a body of experience in choreographed forms, a cross-section of dancers in the East created a "look feel" tribal dance form which emulated the costuming, music, and presentation of tribal, but without the improvisational key that defined tribal during that period. 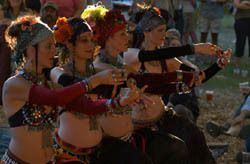 The term East Coast Tribal is meant to define those branches of the tribal bellydance family tree, and encompass those forms which create the tribal look and feel but without the improvisational aspects, as well as the close cousins in dance who developed their style in the SCA/Ren Faire community and have a folkloric slant. While one might be tempted to place such styles under the "Tribaret" definition, I personally feel they are mutually distinct approaches to the dance. Clarification: This definition *does not* imply that all East Coast dancers who do Tribal are choreographed (any more than all American Tribal Style dancers are American, right? ), but instead that this style has it's origins in the East Coast. The definition is meant to illustrate that one of the iterations of Tribal has been a throwback to Classic Tribal, only coming out of the East Coast this time, which is a choreographed form of Tribal with the look and feel of ATS. There are definitely many schools of improvisational Tribal coming out of the East Coast (and it is growing all the time, with more festivals and workshops, as well as teachers cropping up to feed the growth of this style in the East), but this term is not referring to them, who would naturally fall under any number of the definitions enumerated above. East Coast Tribal is referring to the uniquely East Coast style of choreographed Tribal which grew out of ATS/Tribal look and feel, and frankly also from the large SCA population which grew up around Pennsic campfires (which touches the edges or overlaps with the Classic Tribal definition above). It is no surprise to find that this presentation appears to hearken back to Old School Tribal Ren Faire performances, which were the bare roots of the Tribal movement, bringing us full circle. A new style has emerged fairly recently thanks to the popularity of the fusion group, Unmata, who are one of the forerunners of this style. For lack fo a more romantic term, though certainly not lacking pracitcality, I have come to call this "Combo-Based Tribal Improv". The title refers to exactly what it is: a style anchored in primarily long combinations of moves (32 counts +), linked with individual moves common to or similar to ATS vocabulary which I have dubbed "filler moves". These filler moves allow a "breath" between combos, and is necessary to make clean links between specific combos by giving "cueing" time: time in which the dancers may consider where they are in the song, wait for a change which would best synchronize with the next combo they would like to use, and initiate the appropriate cue to indicate the next combo they will lead. This style of improv-meets-choreography allows the dancers to perform much more complex movements which would be otherwise difficult or impossible to cue as individual movements, and additionally allow the performers to dance much faster and with more intricacy and dynamic changes than traditional group improv allows, while retaining some of the more intangible aspects of improvisational connection and energy. A typical Combo Based Improv performance may only require memorization of 5-6 long combos to fill a typical song (ex. 32 count opening combo/entrance - 1-8 count filler move - 32 count combo - 2-8 count filler moves - 64 count combo - 1-8 count filler move, etc...). Performances of this style are quite energetic and exciting to watch. However, a side-effect is that dancers who only study this style of dance could potentially be unable to dance with/lead other tribal improvisational dancers casually, as the combo-based vocabulary is so specific and unique to the groups which choreograph the combos. Attempting to lead a group of dancers who have had no exposure to this intricate brand of improv can tend to either leave the followers in the dust, or intimidate other dancers from trying to participate because it seems impossible to keep up with what is going on. This somewhat sidesteps part of the uniquely connecting aspects of ATS and its offshoots, which, thanks to it's rather cleanly simple (individual moves) and shared vocabulary of movement, allows tribal style dancers anytime, anywhere to be able get up and dance together in synchronicity. However, as Combo-Based Tribal is still young style, many dancers have come to it via ATS/Tribal Improv backgrounds, and thus retain some knowledge of how to dance with others outside those who share their highly stylized combo-based vocabulary. A fusion of hip hop, funk, club dance, and modern dance. Costuming tends to be more minimalist, and the overall mood is one of aloofness. At times I have found this style to venture far too far away from any semblance of bellydance, and does not seem to adhere to any of the conventions of tribal in costuming or presentation. But this is my personal impression, and despite these dramatic stylistic differences, the style is still widely accepted as a sub-genre of tribal. A more recent spinoff of tribal (or another branch of tribal, in some cases), which has been spearheaded by Rachel Brice and the Indigo. Characterized by slow, tension-filled snakelike movement punctuated by pop n' lock stylings from breakdancing. Music varies from world fusion to dark industrial. This style often comes under fire for not appearing to be "bellydance" to many audiences, instead appearing to be popping and locking in the framework of a generally interpretive dance style. It is hard to pin down this style, as it is new and evolving rapidly, and as such, rather than relegate it to the "that's not bellydance" bin, aknowledging its ancestral roots in bellydance and tribal style, I offer the possibility of a new genre known as "Alternative Tribal" or simply "Alternative Bellydance". There are many other considerations in defining different styles of dance. Presentation, music, costuming, and even attitude play large roles in creating this style. I certainly don't have all the answers, and I don't think any will for a long time. Like any facet of art, common definitions develop and solidify much later when looking back. You don't think the "Impressionists" were called Impressionists when they began painting, do you? Well, neither are the artists in this ever evolving genre of bellydance going to be able to be pinned down and defined until a comfortable niche is dug out--until consistent details of the work are developed and stands the test of time. In the meantime, we will continue to discuss, debate, grow, and learn together.